Everyone is looking to save a few bucks these days. You may think you need to pick up a second job to make your monthly bills or start living on beans; however, there are several ways you can benefit from the simple task of cutting coupons. Many families do not take advantage of this easy money-saver simply because it can become time consuming. However, if you simply begin looking through the ads of your Sunday paper, you may find yourself with a bit more spare change at the end of the week. Included here are a few great reasons to begin coupon clipping. This is one of the biggest and most obvious benefits of coupon cutting. The cost of groceries has skyrocketed in recent years, and families have begun to feel the crunch. Many people living in especially rural areas are having difficulty affording the high cost of food. Cutting coupons can allow you to save hundreds on groceries every week. Some “extreme couponers” have been known to leave stores in the negative dollar amount after utilizing coupons! One extreme couponer budgets only $10 per shopping trip and uses coupons to feed her family. One great benefit of cutting coupons is that you can build your meal plan around what is on sale. No more planning meals only to find that one of your key ingredients is outrageously expensive that week. Take time to see what is on sale and find recipes that match those food items. Your cost of food should decrease greatly and you will be able to plan your meals and cut your coupons all on Sunday afternoon. Many households are finding the cost of simple items like paper towels and soap to be astronomical these days. With careful couponing, some people are able to leave the store with their items after receiving money back from the company! You may be amazed to find how much money you can save simply by cutting coupons for your monthly hygiene items. Having a Sunday afternoon coupon cutting session can be hugely beneficial to your children and used as family bonding time. With everyone working together, the coupon cutting will take far less time and your kids will be able to recognize the benefits of frugality. They may benefit directly by being able to have ice cream on sale, or they may see that saving money with coupons allows more vacation time. 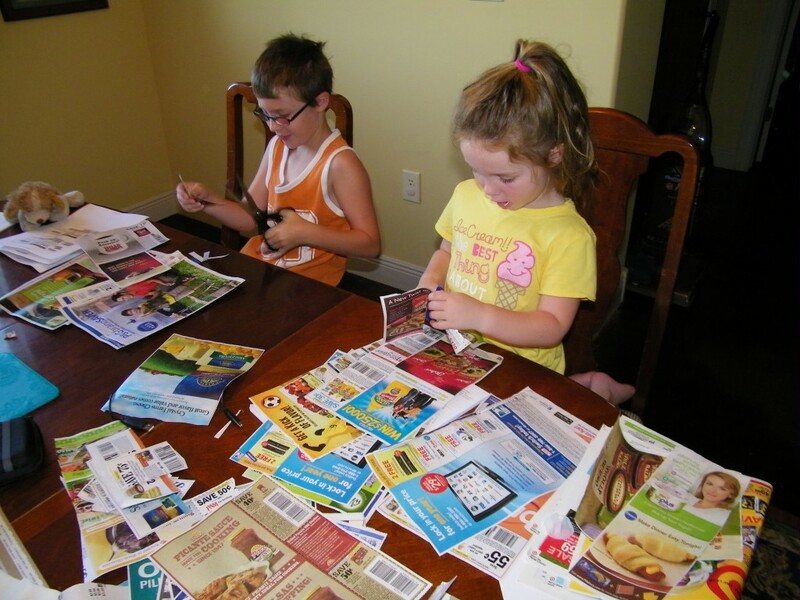 Kids can also learn a great deal of real life mathematics from cutting coupons. Many extreme couponers who leave the store having spent very little money are wizards at combining coupons to cover the cost of their items. Give your children the opportunity to work out the total cost of items on their own and they will get a valuable math lesson with real world applications.